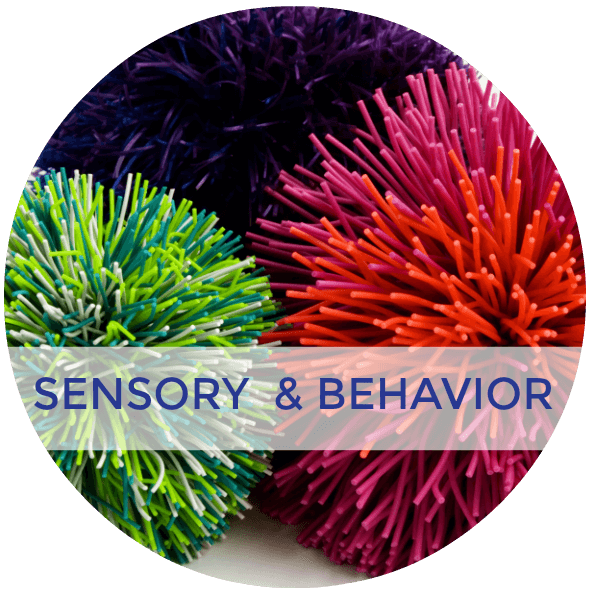 Something I have heard from teachers over and over again is that there is not a lot of sensory processing information geared specifically for the classroom environment. As educators or therapists, we often have to sift through lots of general information or for the home and figure out how to make it fit our classrooms with 25+ kids who are all different! Since each of us respond to sensory input differently, this can be overwhelming and challenging to accommodate in the classroom. Recognizing how each student might respond to being overwhelmed by sensory input is a great place to start. 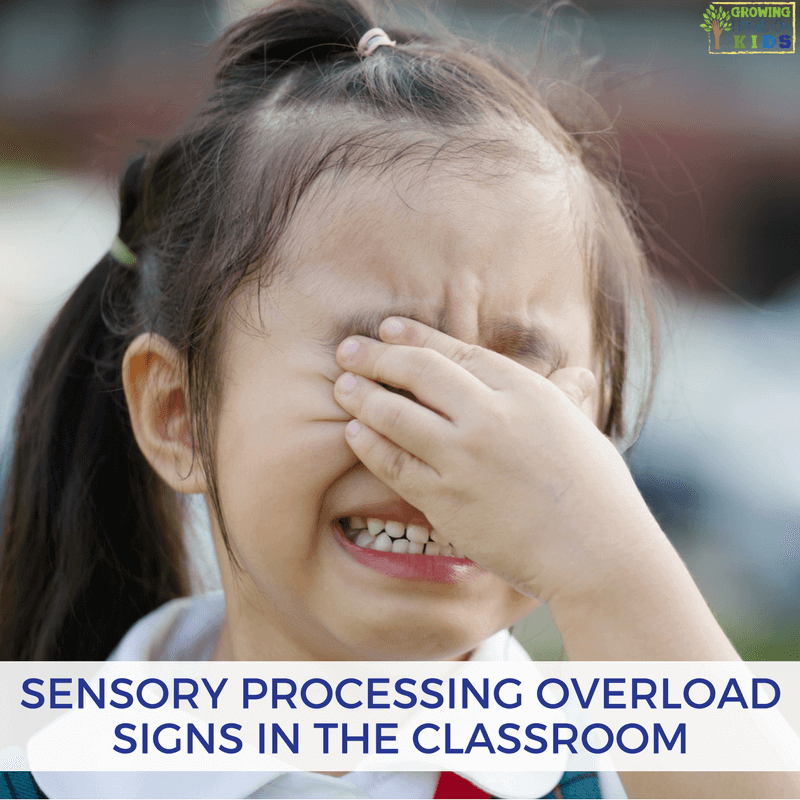 Today I am sharing some sensory processing overload signs that you can watch for with your students in the classroom. 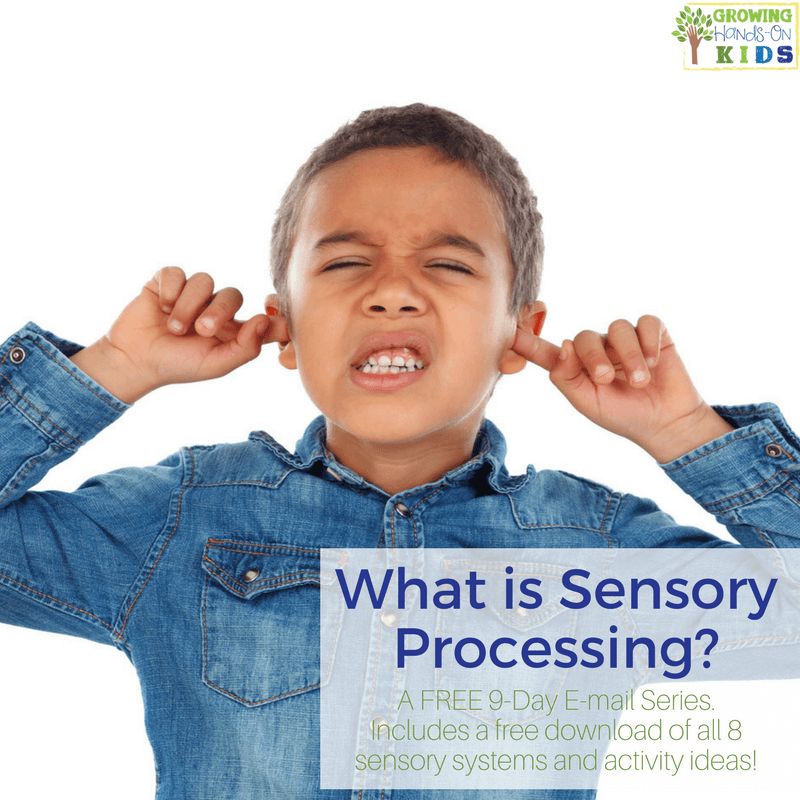 Sensory processing is how the brain recognizes, categorizes, and responds incoming sensory input from the eight senses and the environment around us. All of us respond to this input in different ways. Hyper-responsive (also known as over-responsive or hypersensitivity) -“Sensory Avoiders” -These children excessively responsive to sensory input. 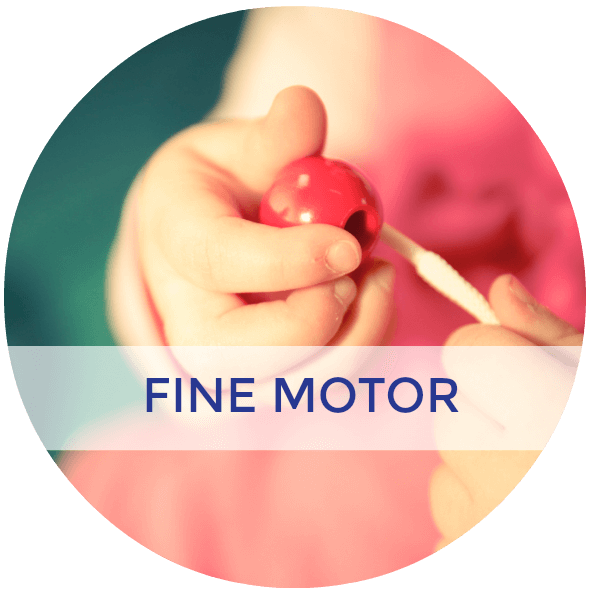 The slightest movement, touch, or sound could send you or a child into a negative behavior response. Hypo-responsive (also known as hyposensitivity) -“Sensory Seekers” – This child does not receive enough sensory input and is constantly looking for it to get to that “just-right” level of arousal. These behaviors can impact their day because they are not able to focus or attend to a task until they are at that just-right level. Under-responsive – These children exhibit a diminished response to sensory input. More sensory input is needed than average in order to get a response. They can look like they are “lazy” or “tired”. Each system has a “hyper” or “hypo” or “under” type of response that you will see in children. You might notice all responses for the same sensory system depending on the activity (especially if it is a new “novel” experience, versus something the child has experienced before). It is also common to be hyper-responsive to some of the sensory systems and hypo-responsive or under-responsive to others. Sensory overload is when the brain becomes overwhelmed with the sensory input coming in and goes into a fight, flight or freeze response. During this time, the brain shuts down all “un-needed” higher brain functions and goes into survival mode. When a child reaches the point of the sensory meltdown, it is impossible to just talk them out of it. Their brain has shut down and is simply trying to survive what it deems a dangerous situation (fight or flight response). 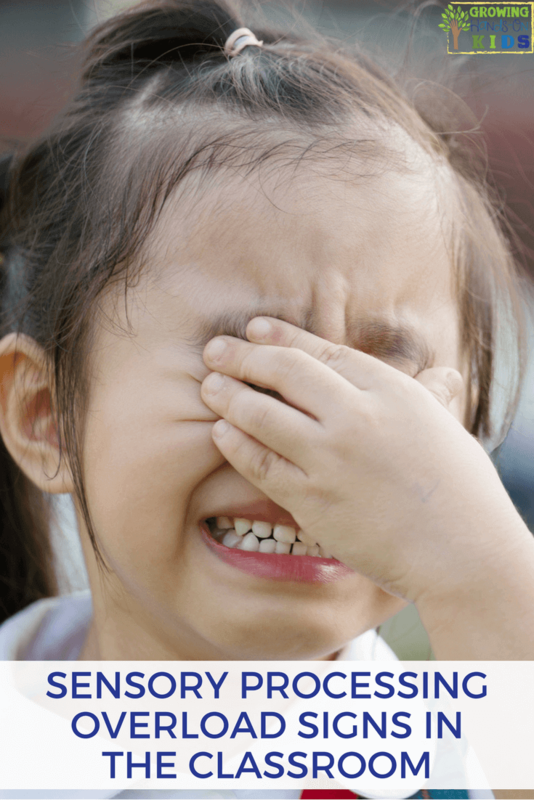 It is important to recognize when a child may be getting ready to have a sensory meltdown so we can try to diffuse the situation and respond with strategies and activities to help them self-regulate. Let's take a look at some of these signs and what you may see in a classroom setting. Before we discuss each of these signs, it is important to note that you may not notice them right away. A child may go for hours (or even days) before showing these signs. Some children will try to “hold it together” at school and then “meltdown” when they go home. It's important to have an open dialog with parents. 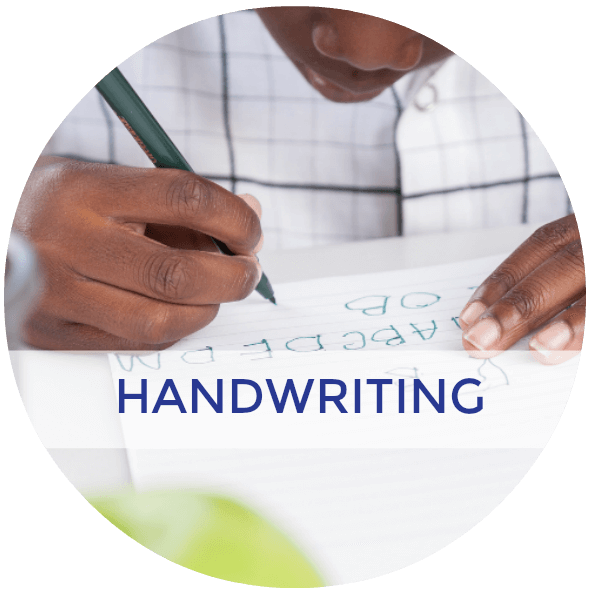 I often suggest keeping an activity or behavior log so you can have communication going back and forth from the classroom and home. It is important to seek medical attention when needed for any of these responses. You may notice this, particularly after a new (novel) task or activity. It can also be noticeable after a lot of gross motor activity, such as heavy work or vestibular input (spinning, crashing, swinging). But really it can be after any type of input, depending on how long a child's sensory processing system can process information before becoming overwhelmed. Each child and system will be different. When you start to notice this, it is important to get the student to a quiet place for them to recharge. Try breaking down instructions into smaller pieces or use visual prompts instead of auditory prompts. 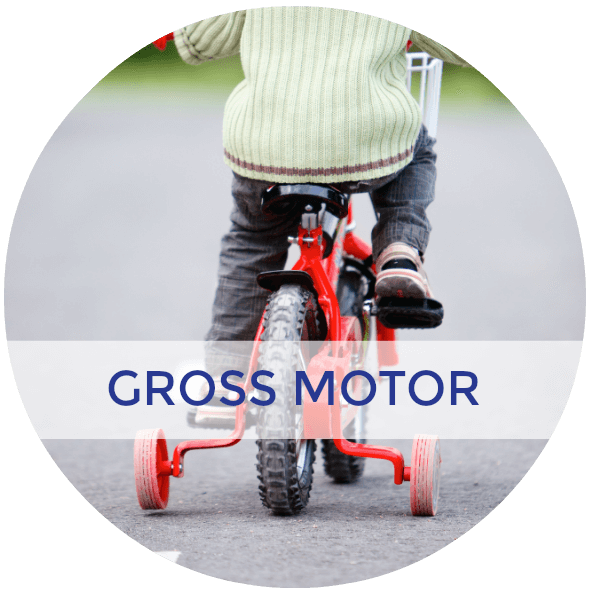 You might notice this with gross motor activity, particularly anything with vestibular or proprioceptive input. Spinning, having their feet off the ground, fear of heights, etc. can have this type of response. Car sickness is often associated with this or any fast, sudden movement. It is important to stop the activity and get to a safe, quiet space. Drinking cold fluids and helping the body cool down will be important to self-regulate. Stop the activity immediately and seek medical attention if needed. Practice slow, deep breaths (smell the flower, blow out the candle). This can look like a student tensing up from fear or becoming “floppy” from feeling overwhelmed. Children in a sensory meltdown may become rigid and this makes it difficult to move them to a safe space. You may notice a student begin to shake, feel weak, or unable to stand upright because their knees or legs give out from tremors. Stop the activity immediately and put the student in a safe position and space. Seek medical attention as needed or warranted by school policies and protocols. Avoid any spinning movement if the student has a history of seizures or heart conditions. Your student may fall asleep and/or need a nap after a particularly overwhelming situation or activity (such as a field trip, assembly, or even gym time). You may hear from parents that the child had a hard time sleeping that night. Lack of sleep can also lead to heightened sensory responses, so parents, make sure you let your child's teacher know if they did not get a good night's sleep after (or before) a particular event or activity at school. When the brain thinks it is in immediate danger, it shuts down higher level brain functions and enters into a fight, flight, or freeze response. You might notice a student become increasingly agitated, lash out in anger (physically or verbally), and it will be difficult to “talk them through it”. Practicing self-regulated techniques while a student is calm and then getting them to a safe, quiet space can be helpful. A student may just refuse to participate or “shut down” and enter a sensory meltdown. IF the refusal to participate is sensory related, it is important to not force participation. This can be tricky to navigate, which is why working with parents, administrations, and your school's Occupational Therapist is important! Making poor eye contact can be for a number of reasons, but when that poor eye contact is connected with these other responses, it can be because of sensory overwhelm. For some students, looking at a persons face and making eye contact itself can be the thing that sends their vision system into over-response. Making eye-contact should not be a way to gauge whether a student is paying attention or listening. Dimming or turning off the lights or having sunglasses available for outside or with overhead lights can be helpful. Loud noises aren't always avoidable, but as much as possible, warn students of any upcoming loud sounds or noises. Having noise-canceling headphones or earplugs can be helpful for many students. Also use a calm, even-toned voice when communicating and keep your words and sentences short and direct. 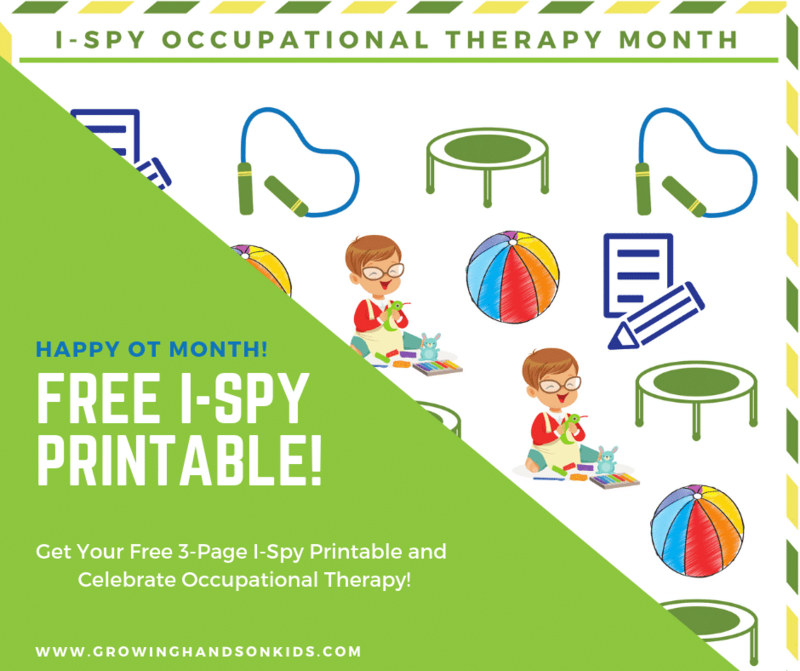 A child may need to take a break in a quiet sensory space or be seated in a different area of the classroom (in the front of the class, or at the back). It's also important to set up classroom expectations for giving hugs and being observant and sensitive to other's personal space. Give the child additional personal space and avoid standing over them or standing too close. Using first/then boards, visual schedules for the day or an activity can be helpful for students who can be overwhelmed by all they need to do. Providing fidget toolkits or brain breaks can help with focus and attention. 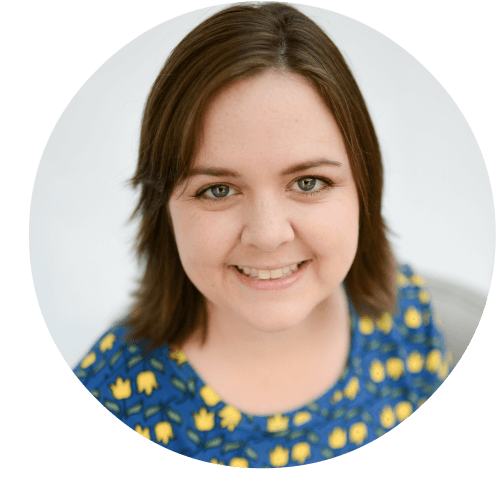 My friend Sharla over at The Chaos and the Clutter has written an amazing post about sensory processing overload signs for parents. CLICK HERE to read Recognizing Signs of Sensory Processing Overload in Children. 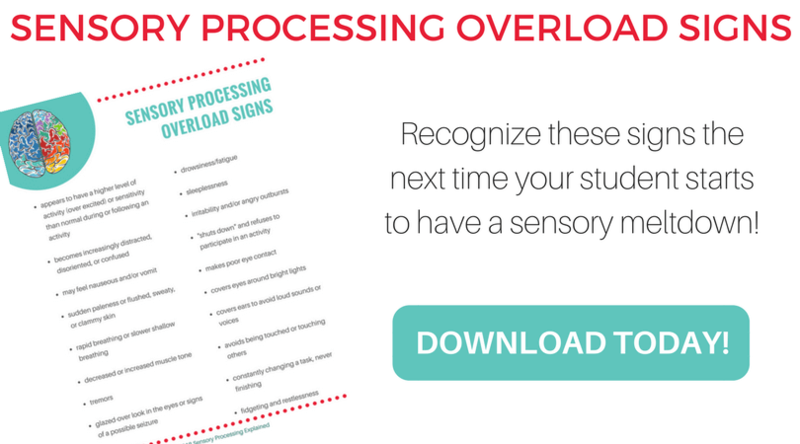 Would you like to have these sensory processing overload signs as a convenient printable to share with your administrators, staff, or parents? Enter your email address below to get a free download of Sensory Processing Overload Signs. 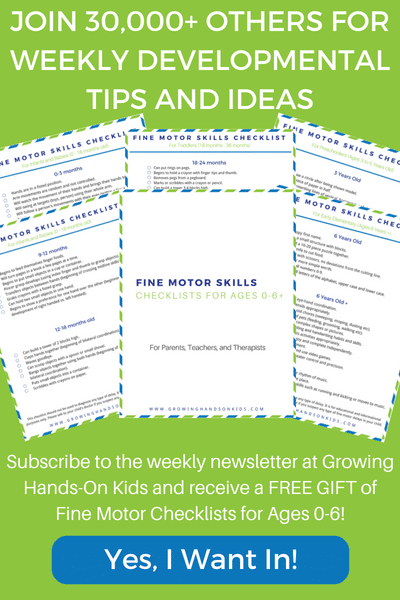 You will also receive weekly emails from Growing Hands-On Kids with more tips and activity ideas just like this one. 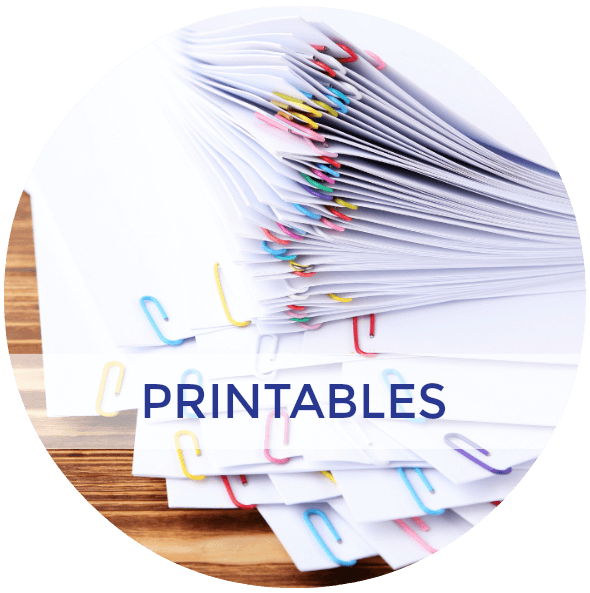 You will also receive promotional emails for new printables or resources. You can unsubscribe at any time. Check out more resources on sensory processing below. 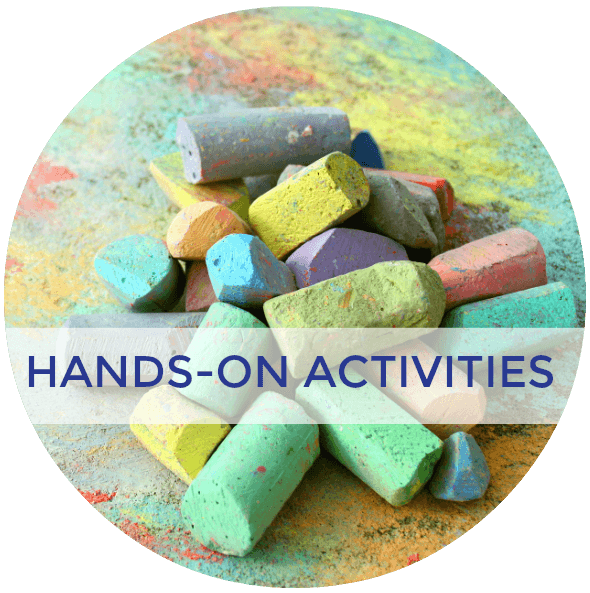 Follow Heather | Growing Hands-On Kids's board Sensory Processing in the Classroom on Pinterest.